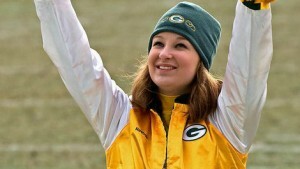 As the recent controversy regarding a Chicago Bear Facebook fan site bullying a Green Bay Packer cheerleader began to go viral, the news team at Milwaukee's CBS affiliate needed a Social Media expert to interview for their 10 O'Clock news. So to find the right person, they did what any self-respecting media organization would do: They Googled it. 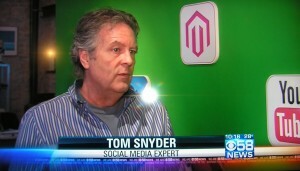 The search for Milwaukee Social Media Expert brought up Trivera on Page 1, position 1, and after a quick phone call, the reporter and cameraman were on their way to Menomonee Falls to interview Trivera's resident Social Media go-to guy, Tom Snyder. Trying to meet a tight deadline in the middle of a snowstorm, the crew didn't even have time to take off their coats, hats and mittens. That caused the realtime tweets and Facebook posts from the team in the office to be met with accusations that we don't pay our heating bills. As the day had gone on the focus of the story shifted. Initially, the story was about a Fan Page featuring a photo and the subject of the photo getting hammered with vicious comments. 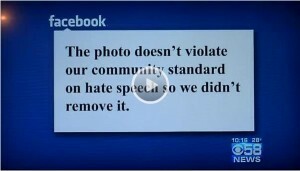 The woman asked Facebook to remove the photos and the post n the grounds that it violated Facebook's anti-bullying rule. Facebook disagreed an refused to remove it. So the woman struck back with another Social Media tool: a YouTube Video. And the battle raged between the haters and the supporters, free-speech advocates and people who demanded that Facebook relent. Eventually even Mashable picked up on the story, and by the time the crew got to our office, the owners of the Facebook page removed the post. 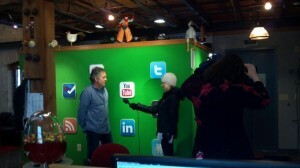 The questions from the reporters focused on whether we felt that Facebook should have removed the post. Tom's answer framed the dilemma Facebook had by asking the reporters if they would remove a news story on their site if the comments to that story turned ugly. He felt that technically, the fan page owners probably had a moral responsibility to remove the vicious and hateful comments. Social Media is admittedly sometimes very anti-social. Bullying goes on there constantly. Fortunately, as proven by this instance, those who are bullied can use the same tool to stand up to the bullies, and get an army of supporters to stand with them. But once again, whether it's for bad or for good...or both...Social Media is a powerful tool, and in the right instances can create viral buzz for the good to win.